Stenciled Coir Mats with a nautical theme. Best Quality Fiber Coir Doormats are bleached and stenciled with Fade Resistant Dyes. 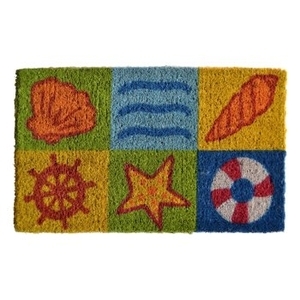 Ocean Life Doormat has bright colored squares with icons relating to the beach. These attractive designs are about 3/4" thick.